The North Dakota Department of Transportation Statewide Active and Public Transportation Plan has been under development for the last 21 months and is a reflection of public input from around the State of North Dakota. The document includes both Active (trails and walkways) and Public (transit) transportation. These two modes of travel were addressed at the same time to insure integration between each other. Public outreach included two advisory committees, 16 public meetings, temporary pop-up demonstrations, online mapping and questionnaire and a project webpage. Your critique of this plan is strongly desired! Download the Draft Plan above to your computer. Read and comment on elements you like or dislike. Document the page and paragraph of each comment, and how you would like to see it stated. NDDOT is developing a statewide active and public transportation plan. The Statewide Active and Public Transportation Plan, or ND Moves, reviews and identifies existing and emerging needs and recommend strategies for the future of biking, walking, rolling, and transit across the state. State, regional, and local stakeholders were engaged in this process to help identify needs and opportunities and provide direction on the overall vision for the North Dakota transportation system. 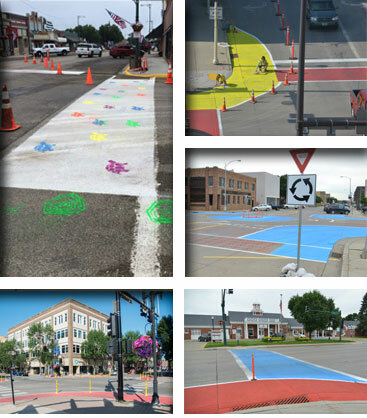 Ultimately, helps to update or establish guidance on statewide programming and policies for NDDOT, and can also provide support and guidance to local communities. Project information including goals, timeline, and study area. Find out more about the Pop-up Demonstration Project and when you can see one near you.